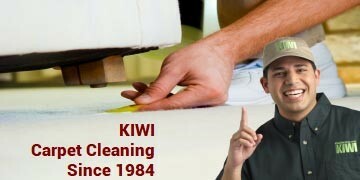 KIWI Services in Phoenix offers the best in professional carpet cleaning. With over 30 years of experience, we have become the favorite and most trusted carpet cleaning company in the area. We know how to get carpets looking amazing and like new. Dust and dirt can ruin the appearance of your carpet, and bacteria can thrive between the threads of your carpet, spewing allergens and toxins into the air you and your family breathe every day. But when you choose KIWI to clean, you can say goodbye to all of those worries! The Environmental Protection Agency recommends that you thoroughly clean your carpets, but ordinary vacuuming won’t cut it. While regular vacuums pick up surface-level dirt, they do nothing about the dust, mites and germs that are often embedded in carpet. That’s why you need to call KIWI Carpet Cleaning; we’ll come to your Phoenix home and make sure your carpets are fresh, clean and safe to live on. We don’t use traditional carpet cleaning methods that leave your flooring soggy for days. Instead, our carpet cleaning process offers a wide range of cleaning options using the most cutting-edge technology. With our carpet cleaning services, you won’t have to deal with the musty, heavy smell commonly associated with steam cleaning. We use a fresh, citrus-scented carpet cleaning solution that’s made from all-natural ingredients. Our solution is safe for use around kids and pets, and it’s biodegradable, water-soluble and environmentally friendly. 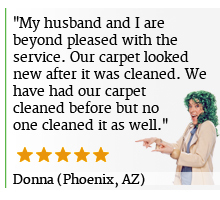 Our Phoenix carpet cleaners are exceptionally well trained. They’re experienced in removing tough-to-dissolve stains (including pet stains and odors), and they’ll answer all of your questions along the way. Heavy furniture is no problem, either; our expert carpet cleaners will move everything as necessary, and they’ll put everything back once the job is done. Because we use a dry carpet-cleaning method, you can schedule your cleaning the same day you’re having guests, hosting a party or showing your home if it’s on the market. Your carpets will be fluffy, clean and ready to walk on in as little as 15 minutes. The best part of what we offer is an airtight One-Year Carpet Cleaning Service We’ll give you an unlimited number of $4 per room carpet cleanings for an entire year after your first service because we know that messes, spills and other carpet hazards are inevitable (a small trip charge applies). KIWI also offers cleaning services for carpet tiles, so ask one of our customer service representatives about it if you are in need. We could tell you how KIWI Services was started almost 30 years ago by a mom who wanted a clean home and clean carpets all year ’round and that we always put our customers’ needs first, but you might like to read what other people are saying about us instead. 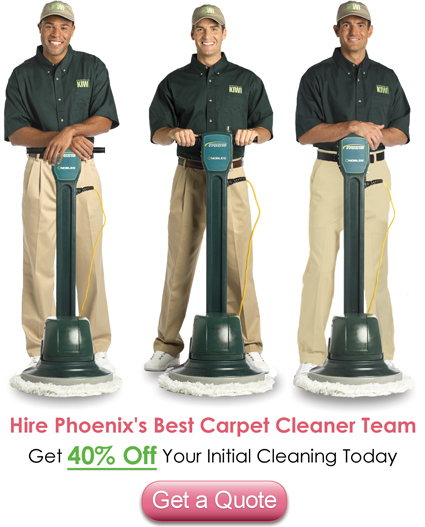 Try out KIWI’s Phoenix carpet cleaning services for yourself. We’re affordable, efficient and extremely knowledgeable about all aspects of carpet cleaning. We’re so confident in our services that we offer a 30-day clean carpet guarantee. Call us at 602-419-3579 today. We’ll set up an appointment that works with your busy schedule; from there, we’ll have your carpets looking and smelling new in no time.